Despite my initial irritation that people somehow perceive me as unappreciative of the incredibly special life I am living as a tour wife, this comment struck me with a great idea. I realized many people have little or no idea what life is like for tennis professionals and their teams as we travel the world with the ATP Tour. As one of a handful of WAGs (wives and girlfriends) who make it to tournaments week in and week out, I am in a position to be able to share a unique perspective of this “traveling circus”. And thus a blog was born. I’m looking forward to the opportunity to share my stories and experiences with readers on The Changeover. As a tennis fan myself, The Changeover has always been a site I enjoy reading thanks to its fresh and interesting approach to tennis reporting. My hope is to contribute meaningful insight into what this less than conventional life entails for tennis players. As the topic of my first post, I would like to stay true to the aforementioned tweet that inspired this blog. This entry will try to shed some light on how our team deals with the extensive travel associated with competitive tennis. 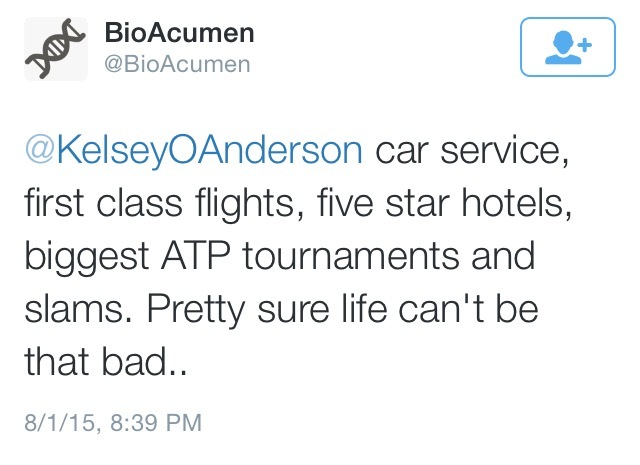 1) Air Transport: Most Tennis Players DON’T Splurge on Business Class Tickets. Although it may seem like we lead a fast-paced and glamorous life on tour, the reality is that very few players indulge in major travel luxuries such as purchasing first class tickets, staying at exclusive luxury hotels, or dare I even say flying privately (gasp!). In fact, this blog is coming to you directly from my coach seat on a U.S. Airways flight to Washington DC. For players like my husband Kevin, who has funded his career entirely on his own, treating your career as a business is of the utmost importance. A big part of any business is keeping expenses as reasonable as possible. When we look at the added cost of purchasing first class fares over the benefit provided, we almost always choose to fly in coach. In fact, I’ve conducted an informal poll among some of our friends on tour: of the 10 top 100 players I have spoken to about it, only two fly exclusively in business or first class (both were top 10 players). The reality is, most players are not willing to pay for the exorbitant cost of these premium seats despite the extensive travel on tour. Fortunately, just because we aren’t purchasing first class tickets, doesn’t mean my husband is suffering uncomfortably on extremely long flights. By earning over 100,000 airline miles annually on American Airlines, Kevin and I are lucky to receive eight systemwide upgrades per year, which we try to use on long-haul flights. We have also used miles to purchase upgrades when a systemwide was not available. This system of trying to upgrade coach seats has served us pretty well. In our time on tour, we have actually purchased only two business class tickets on long flights, but fortunately 6’8″ Kevin has had to squeeze into coach only a handful of times. When we do travel in economy class, we are lucky to still enjoy a few frequent traveller benefits such as waived baggage fees, lounge access, and priority speed through security lines. Although these are excellent perks, travel can still be long and harried. Ask any player and they will have a number of terrible, albeit humorous, air travel horror stories; it comes with the job! 2) Lodging: Homes if we can, but Mostly We Stay at the Tournament Sponsored Hotel. Fortunately, the tour has pretty excellent standards for hotels and we almost always stay at the tournament-sponsored location. This usually makes things much simpler with regards to transportation to and from the tournament, and it is also usually the most economical choice since the tournament will pay for one of our rooms (remember what I said earlier about operating as a business?). When tournaments offer per diem in lieu of a free room, we have a little more liberty to choose our lodging. At these events, our team almost always chooses to stay in a “home” environment either by staying with friends or renting an apartment. We are pretty lucky to have built relationships with some really great people over the years, and we really enjoy staying with them when the opportunity presents itself. In my opinion, it is always more relaxing to stay in a home or apartment rather than a hotel. For one, it is nice to be removed from all the other players and their teams. Staying away from the tournament hotel allows a bit more privacy and seclusion during the tournament. Secondly, it is wonderful to be able to adopt a more conventional lifestyle, even if just for a few days at a time. I cannot express how great it is to be able to eat breakfast in my pajamas, or to enjoy a healthy home cooked dinner. There are numerous other little things about living in a home, rather than a hotel, that I took for granted before I started traveling all year long. Ultimately, I think settling into a house with a more “normal” routine also helps Kevin to relax and feel more comfortable at a tournament. Now THAT is priceless. 3) Ground Transportation: Uber is your friend. Although we occasionally have a rental car, we mostly rely on tournament transportation to and from the airport and the tournament site, but are on our own for any other ground transportation needs. Better ground transportation through Uber has exponentially increased our enjoyment of tournament locations. In the days before Uber, we were often relegated to eating only at restaurants within walking distance of our hotel. Also, previously, my own tourism was limited by the availability and safety of public transportation. No question, Uber has been a game-changer. 4) Telecom: Connectivity at Any Cost. Finally, one of the most important things for me, and probably most other people on tour, is Internet connectivity. Of course we are heavily dependent on the Internet for numerous practical reasons: scheduling practice, checking the order of play, booking flights, requesting Uber, I could go on and on. For this reason, Internet access is vital to our operation. However, in my opinion, connectivity also adds value to our quality of life on tour. While we are traveling, we miss our friends and families tremendously. Modern technology allows us to remain in touch despite being worlds apart. I personally have missed countless Christmases, weddings, birthdays, and even saying goodbye to my family’s dog before she passed away earlier this year. I rely on things like Skype, FaceTime, WhatsApp, and social media to share in these special and sometimes trying times with my loved ones. Making sure our phones and computers work globally is simply a must. Hopefully, this post gave you an inside scoop on how we travel the tour. Tell me what surprised you, and also share your own travel “dos and don’ts” with me in the comments section. Woah, woah. This is super duper cool. Great first post here. Do you always get a free room though? I’ve heard Slams only provide a subsidy on hotel rates,not actual free rooms. I really enjoyed this post and look forward to reading more! Wonderful insight! I travelled a lot for business in the past. It helped me always asking for the same room number in a hotel. I knew where to put everything and felt more “at home” coming back to the same place. The same in the plane: I followed always the same routine. And USD in small bills beside the credit cards is the best to travel around the world. Always appreciated. Best of luck to Kevin during the US Open Series and the US Open! A very interesting insight to life as a WAG on tour. We only wish we were nearer the tournaments in London so that we too could also provide you and Kev with a ‘homely’ place to stay. We’re with you wherever you are and look forward to your next blog! Great blog Kelsey and great addition to The Changeover! I’m assuming that you and Kevin already have pre-check (for US travel). If you don’t, I highly recommend applying for it – or even better, applying for global entry. It will make those airport security lines so much faster.